Oakley Split Time sunglasses answers the demand for function and style. Pilot shaped Plutonite lenses meet signature Oakley O-Matter and C5 metal crafted frames for classic appeal. Perfect for all-day comfort, Oakley Split Time features a slender profile to complement hats for any excursion. 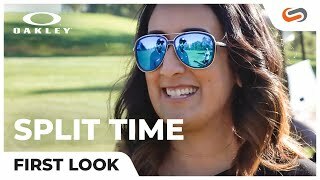 Accentuate life with Oakley Split Time prescription sunglasses, clarity through performance.